Psoriasis is a dry, scaly skin disorder. It is a common, chronic, autoimmune inflammatory disease that affects more than 6 million people in the United States. Psoriasis affects 3% of the global population and appears to be on the rise. It affects both men and women and people with cardiovascular disorders and metabolic syndrome are more likely to get it. Research has shown that it is definitely a genetic disorder and it tends to run in families. Unpredictable and irritating, Psoriasis is one of the most baffling and persistent of disorders. It’s characterized by skin cells that multiply up to 10 times faster than normal. As underlying cells reach the skin’s surface and die, their sheer volume causes raised, red plaques covered with white scales. Psoriasis typically occurs on elbows, knee, and scalp, but it can also affect the torso, palms, and soles of the feet. To fully understand psoriasis, you need to see what’s happening underneath the skin. Patients develop psoriasis when their immune system sends faulty signals that tell skin cells to grow too quickly, normal all skin cells. While symptoms may appear on the surface of the skin, what you can see is only part of the story. With normal skin, your body takes about 28 to 30 days to produce new skin cells and shed the old ones. When your body has psoriasis, your immune system is overactive, triggering skin inflammation and causing skin cells to be produced faster than normal. New skin cells are pushed to the skin’s surface in 3 to 4 days instead of the usual 28 to 30. But your body can’t shed the new skin cells at that fast of a rate. So while new skin cells are being produced, the old, dead skin cells pile up on top of each other. As more and more new skin cells are produced rapidly, the old skin cells are pushed to the surface, forming the thick, red, itchy, flaky patches known as plaques. Red, raised inflamed patches of skin. Silver-white scales or plaques on the red patches. Dry skin that may crack and bleed. Itching and burning sensations around patches. Plaque psoriasis: Characterized by the red and scaly skin on the palms of the hands and/or feet with tiny pustules. Guttate psoriasis: It often starts in childhood or young adulthood, is characterized by small, red spots, mainly on the torso and limbs. Triggers may be respiratory infections, strep throat, tonsillitis, stress, injury to the skin, and use of anti-malarial and beta-blocker medications. Inverse psoriasis : characterized by bright red, shiny lesions that appear in skin folds, such as the armpits, groin area, and under the breasts. Erythrodermic psoriasis: It is characterized by periodic, fiery redness of the skin and shedding of scales in sheets, this form of psoriasis is triggered by withdrawal from a systematic psoriasis treatment, severe sunburn infection, and certain medications, and this requires immediate medical treatment because it can lead to severe illness. Pustular psoriasis: is characterized by white pustules surrounded by red skin. 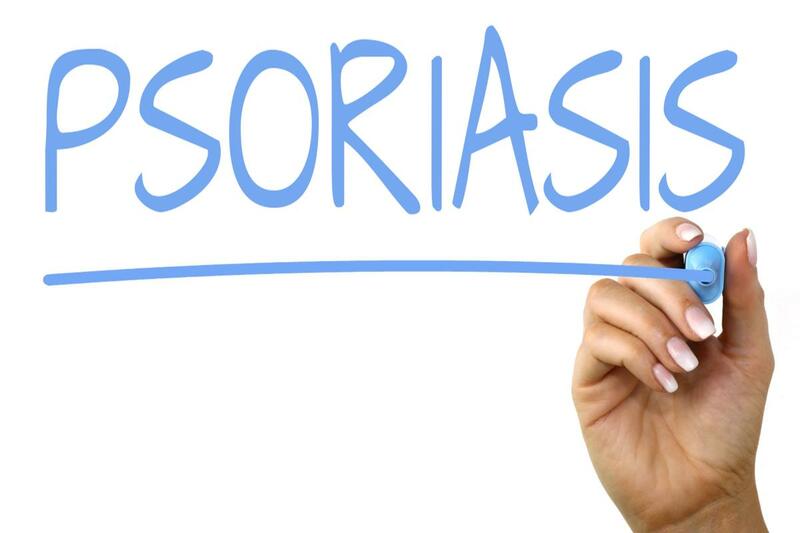 People who suffer from psoriasis know that it is uncomfortable and at times a disfiguring skin disease that can be difficult and frustrating to treat. The condition comes and goes in cycles of remissions and flare-ups over a lifetime. While there are medications and other therapies that can help to clear up the patches of red, scaly, thickened skin that is the hallmark of psoriasis. Three main treatment options include systemic therapy, topical therapy, and phototherapy. Systemic therapies work through the body system. Some affect the whole system, and they are used for people with moderate to severe psoriasis. They are taken by mouth or by injection and include acitretin, cyclosporine, and methotrexate. One type of systemic therapy is biologic drugs. A biologic is a protein-based drug that is made from living cells grown in a laboratory. Biologics target the specific T cells that are associated with psoriasis. Topical treatment is applied directly to the skin. It is usually the first line of treatment, and the aim is to slow down the growth of skin cells and reduce inflammation. These treatments are available over the counter (OTC) or on prescription and include non-steroids and steroids. Phototherapy is light therapy. The skin is exposed regularly to ultraviolet light, either in the doctor’s office or at home. This is done under medical supervision. Tanning beds are not recommended as a substitute. Practitioners of Ayurveda believe that every person has a distinct energy pattern made of three types of energies. These energies are known as doshas, which maintains the body equilibrium. Ayurveda practitioners believe if your doshas are out of balance, you feel stressed or fall sick. The goal of Ayurveda is to keep your doshas balanced for optimal health, according to these references, psoriasis is considered as the vitiation(fault) of Vata and Kapha. Accumulation of low potency poisons (Dooshivishas), are the basic pathological changes taking place in the system. Irregular food habits, consumption of foodstuffs that should not be eaten together. (Eg: dairy products with fish), excessive intake of yogurt, black gram, seafood, sour and salted items etc. This can activate the pathogenesis. Alcohol and tobacco consumption will act as a catalyst here. Ayurveda does emphasize on the effect of stress in the pathogenesis of Psoriasis. The main Ayurveda treatment used to treat psoriasis is Panchakarma therapy. Panchakarma treatments use plant-based remedies and dietary changes. These are meant to detox and purify the body. A vegetarian diet is often recommended. Black nightshade juice to reduce inflammation. Boswellia (frankincense) to reduce inflammation and support the immune system. Psoriasis can be triggered by stress, both physical and emotional. Meditation and exercise may help reduce stress-related psoriasis flare-ups. Both of these activities are included in Ayurveda treatment plans. Studies and research have shown that the popular Ayurvedic herb, Ashwagandha, also known as “Indian Ginseng,” has anti-stress properties and is a beneficial restorative tonic. Psoriasis can be treated, and the flare-ups can be painful enough to interfere with your day-to-day life. However, you can lessen the impact of flare-ups by proactively controlling your symptoms and inflammation by following a healthy and disciplined regime. Studies and research have shown that patients with will power and by following the do’s and don’ts have managed to combat this skin disease.